“It is a great honour and responsibility to follow so great a man”. He said it well, but what a overwhelming task: to step into the shoes of our beloved priest of 48 years. Rev. Albert James Goldring helped say goodbye to Canon Marsh and then became our sixth Rector. 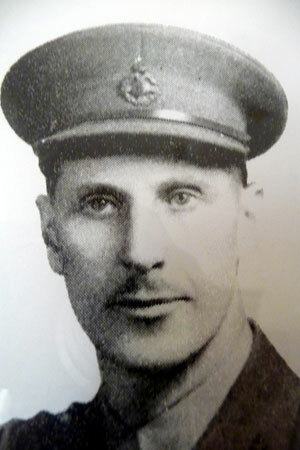 He was born at Port Whitby in 1900 into a family of lake sailors hailing from Sussex, England and Cavan, Ireland. Trained to be a priest at Wycliffe College, he went west to do missionary work. 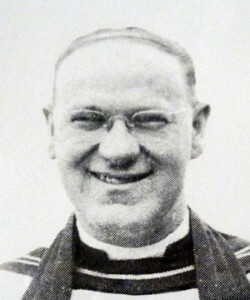 After coming back to Toronto as Curate, he was asked to come to Lindsay to join St. Paul’s as Curate in 1928. And the Lindsay he came to was changing. We still bought jewelry from George Beall, paid $265 for a second hand Chevy coupe from Kawartha Motor Sales, 17 cents for a dozen eggs and listened to the Al Goodwin Orchestra on CFRB. Seemingly inevitable events carried us toward another war. Hitler’s European ambitions ratcheted up international tensions, Poland rejected his “one-sided demands”, Britain initiated conscription and Lindsay’s Dominium Arsenal re-opened for military business. The King and Queen crossed the Atlantic to tour our nation and our eyes were opened to our own country. All that they saw became vivid news. School maps traced their route. LCI students traveled to Riverdale Park in Toronto to see them. The local paper trumpeted, “Canada’s King Assumes his Throne”, as George 6th spoke to us from our Canadian Senate’s throne chair. Lindsay’s 45th Battery mobilized. Chamberlain sent a “final ultimatum” to Hitler. Poland’s cities were bombed. France declared martial law. Then the real war started. Lindsay’s recruiting officers signed up volunteers who were lined around the block. An unusual number were turned away with poor teeth. One man complained, “I thought we were going over there to kill (the enemy), not eat them.” A few men charged with crimes asked judges to let them “voluntarily enlist” rather than face severe sentences. Polish soldiers battled desperately to save Warsaw. A U-boat sank the passenger ship, Athenia, and there was a curious Lindsay connection: “(An) $1800 order for curling stones for the Lindsay Curling Club rests on the bottom of the Atlantic”. Fifty pairs of curling stones from Glasgow bound for Lindsay had been aboard. It was a war with powerful photographs: images that built horror, then anger, then resolution. On December 6th, 1941 (President Roosevelt’s “Day of Infamy”), our local paper spoke with unintended symbolism of the hungry wolves massing on Victoria County’s borders. Just hours later, Japanese planes flew off approaching carriers to bomb Pearl Harbor. The U.S. declared war. And in Victoria County, local hunters banded together to hunt our wolves. Back home, those too young for war prepared to be future leaders. One was to become a Lindsay barber, future mayor of Lindsay, M.P.P. and provincial Cabinet Minister. “Rev. T.C. Wolfram installed young John Eakins as President of the Young People’s (Association) of Queen St. Church”. Then there were others very unlikely to become our leaders. “(Police) Recover Stolen Goods in Wild Chase”. Using a sequence of two stolen cars, thieves stole goods from Webster Bros. in Fenelon Falls. Racing toward Lindsay with the Fenelon police close behind, they fired a pump gun at the police who fired back, wounding one of them. Roaring down Colborne St. West and onto William, they pulled into a driveway, abandoned the car and their stolen goods and fled. Too many farmers signed up to fight. A provincial school-age amendment was passed to allow 15 year-olds to leave school and work the empty farms. In late November, Lindsay planned an air raid warning and blackout. Reporters filed this story. As Rector, Rev. Goldring expected much of us if we were healthy and spent much of his own energy helping us if we were sick or bereaved. He worked with other ministers and the Lindsay Board of Education to develop a “bible study” curriculum to be taught in the public schools and his own assigned school was Central Senior. He also joined other Lindsay ministers in developing a “Week of Prayer” with services every day in successive churches. In one, he expressed his own religious beliefs during war. “God doesn’t promise us immunity from the hard things of life. There may be dangers ahead. We might even have to die for our faith. But all we can do is (to) take Jesus at his word when He said ‘I will never leave thee’”. Finally, Rev. Goldring told St. Paul’s that he felt impelled to sign up himself. While his health was not good, he finally passed the physical, took a leave of absence from St. Paul’s in late 1942 and reported for duty. He never did return to us. After the war, he became a chaplain in military and civilian hospitals. Rev. Clinton Cross replaced him. Born in Galt in 1911 of English and German ancestry, ordained Priest in 1939, he came to us with three years experience. He quickly entered the life of the church and town, becoming President of the Twenty Club and the Lindsay Musical Association, Chaplain of three organizations: the Curling Club, the Royal Canadian Air Cadets and the Canada-wide Anglican Young People’s Association, and was appointed Rural Dean of Victoria. Church receipts jumped. Bazaars and concerts grew. He welcomed new parishioners. “Many newcomers are worshiping with us. While the Church is the House of God .. it is also the House of Friendship”. While the war occupied our minds, large and small church matters also crept in. In June, 1943, St. Paul’s beautiful steeple was struck by lightning and needed extensive repairs. Later that year, St. Paul’s Warden, Judge McGibbon asked Town Council to share the cost of a strong, high fence between the old parking lot (now the liquor store) and the church and to move a decrepit old ice house from that lot. Council balked, until one councilor commented: “On the other side of the street, you have a dance hall and beside the church you have a parking lot (with an ice house). Surely the congregation should have some privacy”. Council quickly paid half the fence but tabled the ice house matter. War news continued: “Russians Commence Big Push”; Canadians Take 18 (Sicilian) Towns”. We learned of the war’s impact on those at home: “(Mr. and) Mrs. Percy Nugent of Lindsay’s (son) Lieut. William F. Nugent (is) a prisoner in Hong Kong (and) Sgt. Pilot John A. Nugent (is) in a German prison camp.” Later, a third underage son, Wilburt (called “Wib”), found a way to join and go overseas. At the Cenotaph, Rev. Cross spoke of Great Britain. “All through the ages, the British Empire has stood for freedom .. (and) twice in this century she has stood alone in this struggle”. Quoting from Field Marshall Kitchener in 1914, he said “You are ordered abroad as soldiers of the King, to help against a common enemy .. do your duty bravely”. And young people at home helped. “Lindsay Girls Jamboree Is a Grand Success .. 1700 people raise $800 .. for (naval) depth charges”. On D-Day, June 6th, 1944, the 3rd Canadian Infantry Division stormed ashore at Juno Beach through German machine gun fire, struggled inland and established a critical beach head. Over the next ten months, we moved east. In late March, 1945, the 9th Canadian Infantry Brigade crossed the Rhine. During April, we pushed the Germans out of the Netherlands. That spring, newspaper reports of injuries and deaths rose. While war’s end was clearly close, prayed daily because we knew our sons and husbands still fought. Finally on May 7th, the Post reported that next day “will be treated as ‘Victory in Europe Day’”. “Pandemonium broke loose and buzzers, bells and whistles .. were pressed into service ..”. Most of us celebrated downtown. Some of us prayed in our churches. A few read the newspaper that day and saw a picture of an old couple standing beside a grave. The caption read: “Excuse us if we don’t join the celebration”. The Pacific War continued for three more months. On August 14, 1945, the Japanese surrendered. The war was truly over. That same year, St. Paul’s celebrated sixty years of “New St. Paul’s” life in Lindsay. Rev. Cross constructed our Diamond Jubilee booklet and Canon H.H. Marsh, son of Canon Charles Henry Marsh, was our key-note speaker. Three years later, Rev. Clinton Cross was called to Barrie. A new post-war era was to begin.